Today we are talking about starting a business and making money as a novice holistic entrepreneur. I’m so excited to share with you my tips and strategies that have helped me and others generate revenue from $1,000-$14,000 from hosting epic workshops and events. The formula used to launch can be used to launch your holistic business. Excited? Keep reading! So maybe you have a 1-on-1 practice, or are tired of getting paid per person/per class, or you are tired of lining up clients or students one by one. Or you are wanting to start your own business outside of the studio and do things your way. I totally get it. I’ve been there myself. In order to leverage your gifts, you got to get in front of more people. I truly believe group settings, as some of you know, is a very powerful transformational experience that adds value to what you are offering. I also believe people learn better and grow the best when they are in group environments. So why not host a specialized event or workshop where you can be in front of more people, spend more time with them, and create an ever lasting experience that others will rave about. I had the honor to have Tim Ferriss, the N.Y Times Best Selling Author of “The 4-Hour Workweek” and Noah Kagan, Founder of AppSumo be my mentors for five days to get me out of this painful struggle of being a yoga studio teacher to being a full time holistic entrepreneur. This meant getting clear with what I wanted. My income goals, upcoming goals to accomplish, vacations, and dreams. I never thought about getting clear on what I wanted in my life. We got down to the point of getting clear in the six months to 12 months. This helped to catapult my heart and energy into starting my own business. You: What do you want in your life? What are some of your goals? How much do you want to make per month? Getting clear first is the most important thing you can do with your life and business because you will see the bigger picture. My Vision: The idea of hosting a Holistic Disco Yoga party came to life. I always had this dream to hold a really fun party that included yoga, dancing, and a way for people to have fun without being around drugs or alcohol. How did I validate this idea? I had asked my past students and friends what they had enjoyed in the past. Looking for trails of what has worked in the past helped me to create my next idea. Now all I had to do now was test the idea. You: What can you do to make yourself stand out? What makes you different from the rest out there? What trails can you uncover to help you launch your business idea or workshop? Remember that being different, makes a HUGE difference. This is one of the most important things you can do for yourself when creating an event. Tim, Noah, and myself sat down and went over some major steps in this planning strategy session. After getting clear with what I wanted in my life and what my vision was, strategizing a game plan became more exciting. Because I was able to see the bigger picture, this gave me the motivation to continue going forward. We went through a process of clarifying the objective, practicing starting other businesses, created scripts, and came up with a marketing strategy for my pre-launch. I was so grateful I did this because it helped me from spinning my wheels which I know a lot of people do to having something concrete to follow. I had 36 hours to market myself and fill up my Disco Yoga Party. I had the most intense fear I had ever experienced in my life. All these gremlins were coming up, “Will people like me?” “Will people show up?” “What if people think I’m crazy” “I don’t deserve this” “I don’t want to bother people”. I had to deal with it and mentally prep myself by facing my own fears in public. I did Tim’s famous coffee challenge where I went into a coffee shop and ask for a discount on coffee. Then I had to learn to do a backflip in one hour. Then I had to eat snails (escargot), ew gross. The reason why we did this was because Tim and Noah wanted to condition me to walk through fear. And you my friend, need to do the same thing. You: What are some fears that are coming up for you when it comes to putting yourself out there and creating your epic event? I suggest that you go out into the real world and face those fears asap. With my marketing strategy, I went to town. I sold out my event, with pre-paid sales in under 36 hours! And I also found a FREE venue. Wow! Now all I had to do was focus on the content of the event, deliver, and take feedback. After getting receiving pre-sales, I knew that I was going to have people show up. This was so insightful for me because it confirmed that people really wanted to attend. All I had to do now was create the product, the party. A lot of people usually do the opposite: Create then hope people will buy. But then you risk people NOT buying because you are totally sure if people are interested. This causes a lot of wasted time and energy. The party was a success! For it being a last minute event, I would say that people had a lot of fun! I made $330 in profit that night. I didn’t have to split the costs with anyone. This opened my eyes to possibility. The following week, I had pre-sold the same event at $1,050 in profit where I had only ten students attend. I didn’t even “work” that week. One event, 2.5 hours long, and profit. I learned that you want to have the least cost of failure by using the resources you have. Don’t invest too much in the beginning until you start making money. What is the minimum things you need in order to launch your business or workshop? What is the important thing you need to focus on? Follow this exact system and you can launch your own business or workshop. Since then, I’ve followed the exact same system to build communities I’ve always dreamt of and create other events and workshops where I was able to upgrade attendees to have consults with me or to sign up for packages. Disco Yoga eventually turned into an offering for San Francisco startups to provide them with an amazing experience that strengthens teams, lowers stress, and builds creativity. 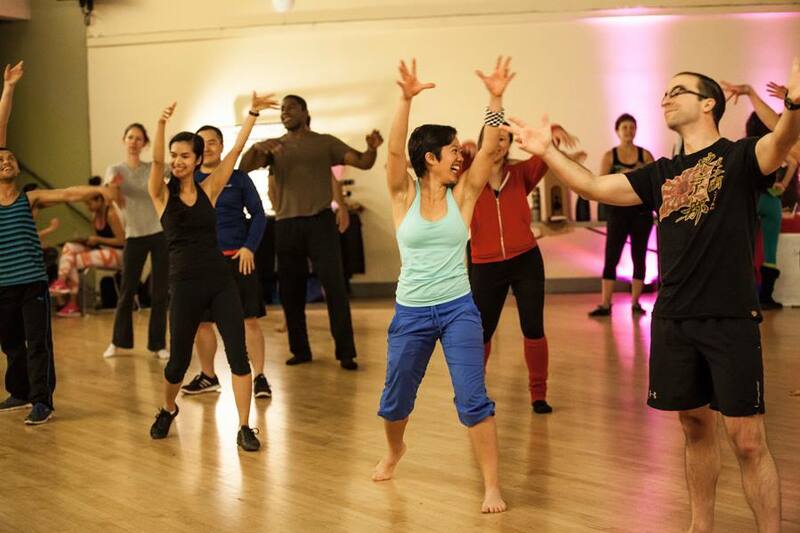 Queer Yoga San Francisco is a community of over 400 LGBTQ Yogis that provides classes, workshops, and retreats. Creative Genius is a community of over 300 holistic women change makers who want to strengthen their leadership skills, find their powerful voice, follow their passions, and build their confidence. Now for most holistic entrepreneurs, you are super busy and are trying to find ways to leverage yourself. I would say that group settings are the best way to convert people because your people are connecting with you face to face and they get to dive deeper with you. This is the gateway for you and your people. Imagine you held a signature event or workshop, you had 30 people attend, and 20% of them signed up for your $1,000 course or program. That’s 6 people. You just made $6,000 from one event. At your event or workshop, you need to make an offer for your people. What is the next step for them? Is it a coaching package? A group program? A course? A retreat? A package of classes with you? You need to come up with an offer to give to your people at the end of your event! Ying Han called me at midnight, less than 24 hours before her workshop with only one person signed up. With just a couple simple strategies, she was able to execute on them and sold out workshop! She ended up having a $14,000 month. “In under 12 hours, the room was OVER capacity and I SOLD OUT! Two extra seats over!” –Ying Han Cheng. Another amazing coach came to one of my “Make Money with Events” workshop in San Francisco and she utilized some of the strategies in community building that she learned at her own event. She ended up making $13,000 from that event alone! Workshops I think under utilized gateway tool for making money, building community, and leveraging your skills as a holistic entrepreneur. It surely doesn’t have to be hard. You don’t have to be burnt out. And you don’t have to do it alone. By you stepping into your power and your authentic voice, I am confident you can take your business to the next level, make more money, and support MORE people who desperately need your gifts to help guide them through events. This is just one model you can follow so you can start or grow your business. Use this as a funnel to generating more income. This blog is to help you see the bigger picture or to get started, but there’s definitely more. If you have read this far and you’d like to take it a step further, please add yourself to my community as I have lost of information to share about getting yourself out there, taking the big leap, and creating formulas to leverage yourself. Receive bi-monthly insider tips to fill and grow your community!